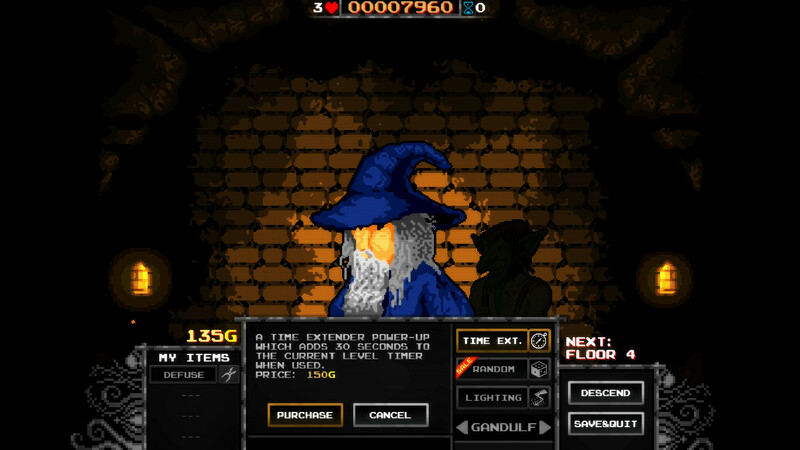 Into the Gloom 1.1.1 released! Some weeks ago the version 1.1.0 was released on Steam, said update took a lot of time to be released since the game needed to be ported to newer engine version and many stuff had to be made again. It also featured steamworks integration, including achievements and cloud save. Since no update I ever do is 100% clean, because bugs are sneaky, there were a few annoyances left in the final build. Today the v1.1.1 patch was released on Steam and hopefully the game won't be causing any more bugs, but if you encounter any, remember that you can actually report them in the steam forums bugs thread so they can be fixed. I'll soon start working again in Downbreak updates, I've been a bit busy lately, but in the coming weeks I'll be back into it. Downbreak! The gravity based minesweeper. Downbreak is all about breaking crates, placing flags and descending to the lowest point of the level. Get rewarded by your risk management skills, trade your gold and customize your magic items inventory; try your luck and fortune on the many random mini-games you will encounter along your way and prepare for the unexpected challenges that await you! People swept mines for ages... but now things have changed! 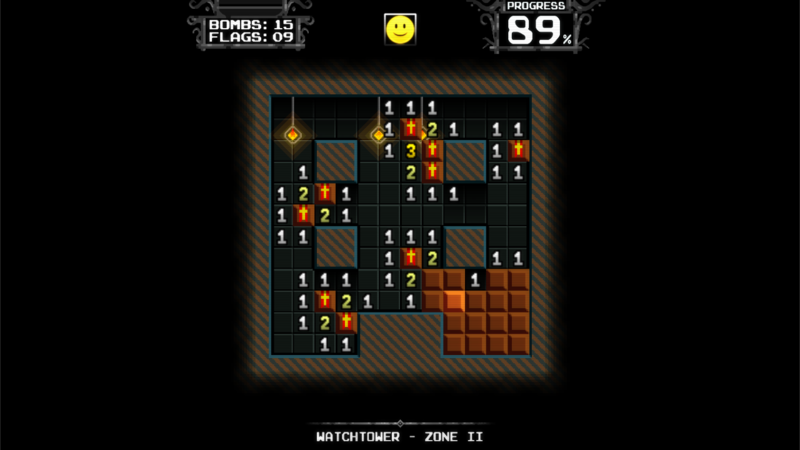 Downbreak brings back elements of the classic Minesweeper with a retro style modernized design, different & challenging new game mechanics and humorous presentation. This time there will be gravity. 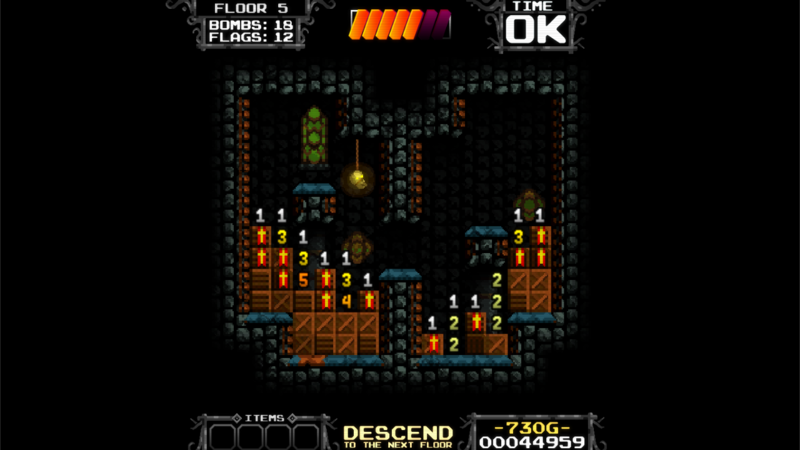 The bombs will fall and stack as you make your way down through over 300 challenging levels. 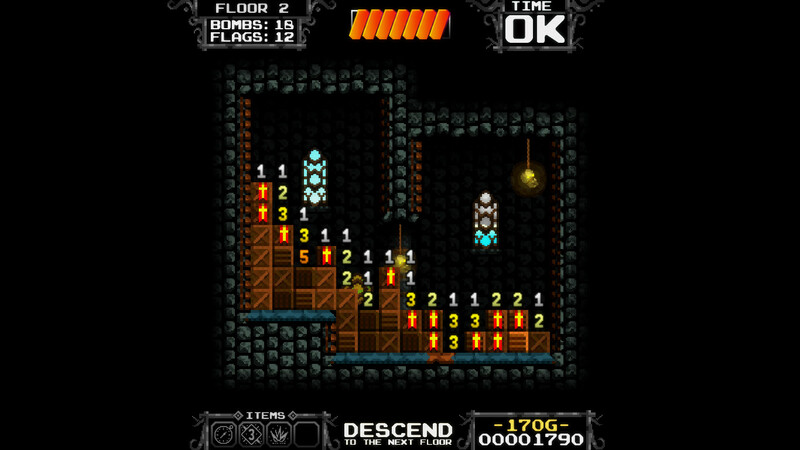 The game is divided into 6 episodes, each episode have several towers which consist of a number of connected levels. Try to uncover the secret that lies in the foundations of the ancient towers and go back home with the treasure... if you can! After several months of hiatus (not releasing anything) I decided to try out this little concept. 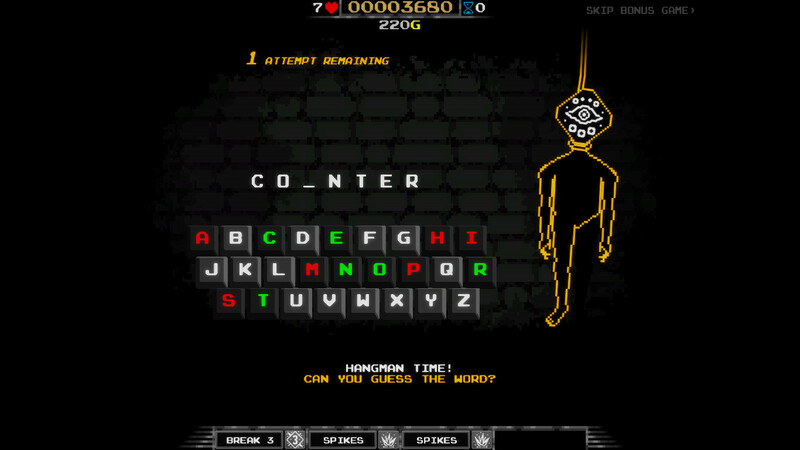 Downbreak is maybe an strange game and certainly not for everyone, but if you like minesweeper you might really enjoy this game. 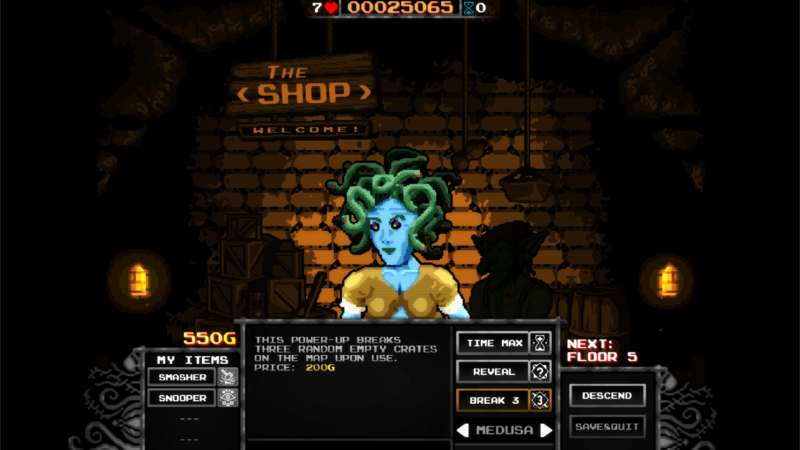 Over 300 campaign levels featuring refreshing gameplay mechanics as you progress. Loads of magic items to use at your advantage. Plenty of random minigames (13 in total) to get rewarded for your skills. 3 Unlockable extra modes in addition to the Campaign Mode. Classic Mode: Play a wide variety of maps without gravity and just like in the classic game! Challenge Mode: Clear the level before the timer runs out and without dying! 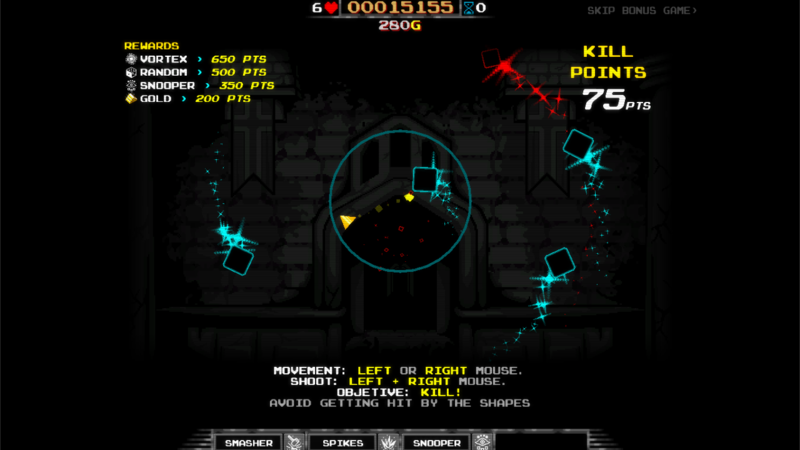 Infinite Mode: Test your patience and focus on reaching as far as you can in the infinite towers. 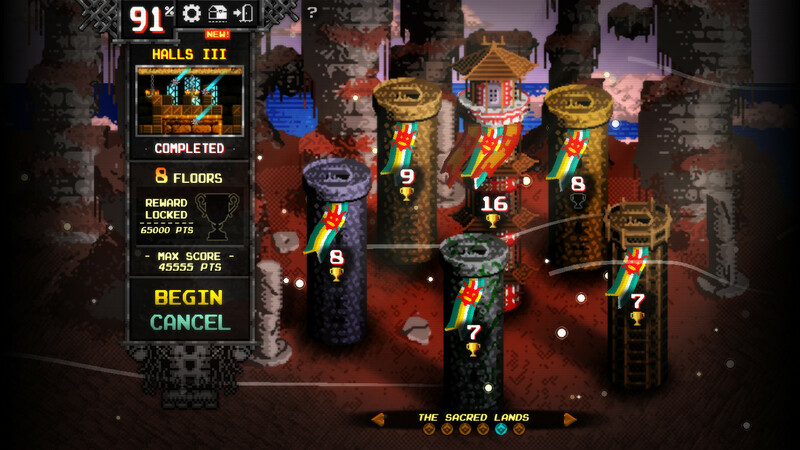 Online leaderboards: Try to beat your friends' scores in any of the game modes and get your place in the leaderboards! So well, the game is almost finished, it still needs the steam API to add the online Leaderboards, achievements and those kind of things. Right now I'm just testing, adding more polish and fixing errors, but you see I really don't know how long will it take to pass Greenlight. If you feel you might like this game and want to support the project you could give it your vote in Greenlight and or spread the voice, I would really appreciate that. In the coming weeks a pseudo demo version could come, I'm thinking it will be a small browser based game here at my site, I have to do my research first to know if it can be done of course. So anyway, my deepest appreciation to you for spending some minutes of your life reading this post, I have a lot of faith in this project and your support is really valuable to me. So, I finally did something... Downbreak needs your vote! Hello there! after several months of hiatus I decided to try out a little concept I had in mind. Downbreak is maybe an strange game and certainly not for everyone, but if you like minesweeper you might really enjoy this game. 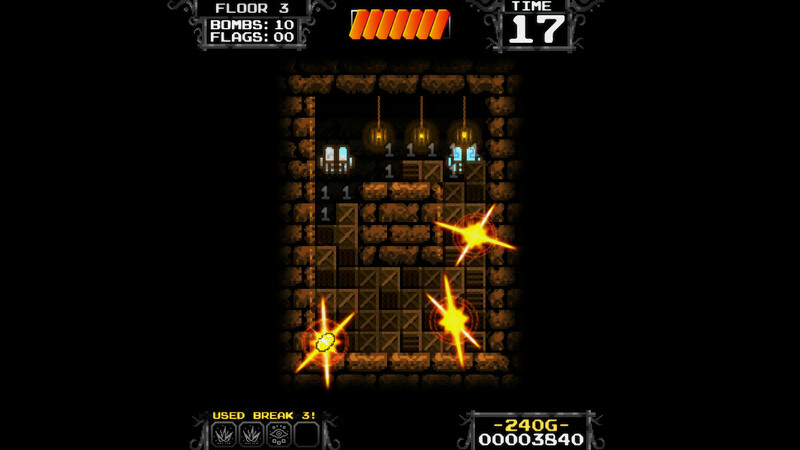 The principles are simple, like in minesweeper you must avoid bombs, but this time the crates will fall and stack as you try to make your way down the tower. Give it a look! Good morning, maybe many of you noticed that some (if not most) of the pictures on my site are broken, I don't come over here much if is not to post an information or project progress, it was a surprise for me to discover that Picasa web is no longer being supported(site where I hosted my blogger stuff), and even when they said my pictures are still there, some works, but some other doesn't, I'll be fixing that stuff soon, I'm about to partially finish a small project (you will soon see it on Steam Greenlight, hopefully), once I do that I'll make some updates to the site.